At the beginning of the 20th century, Chinese Empress Dowager Cixi (Flora Robson, Saratoga Trunk) is persuaded to kick foreigners out of the country. The Empress orders the Boxers, a rouge group of Chinese fighters, to kill foreigners at will. This action paves the way for the eventual fall of the Empire. Grandly directed by Nicholas Ray (Johnny Guitar and Rebel Without a Cause), this reenactment of the 1900 Boxer Rebellion in China mixes historical facts with fictional characters. 55 Days at Peking is a pretty good epic for the most part, but some glaring flaws keep the film from reaching greatness. The film was produced by Samuel Bronston (John Paul Jones and The Fall of the Roman Empire), one of the most powerful independent producers of the era. Brosnton specialized in big-budget, sprawling epics and this film is no exception. It’s a long, laborious movie with eye-popping sets and a cast of thousands. The excellent music score by veteran Dimitri Tiomkin’s (High Noon) is truly spectacular. The script, an adaptation of Noel Gerson’s 1963 novel of the same name, is the weakest link here. 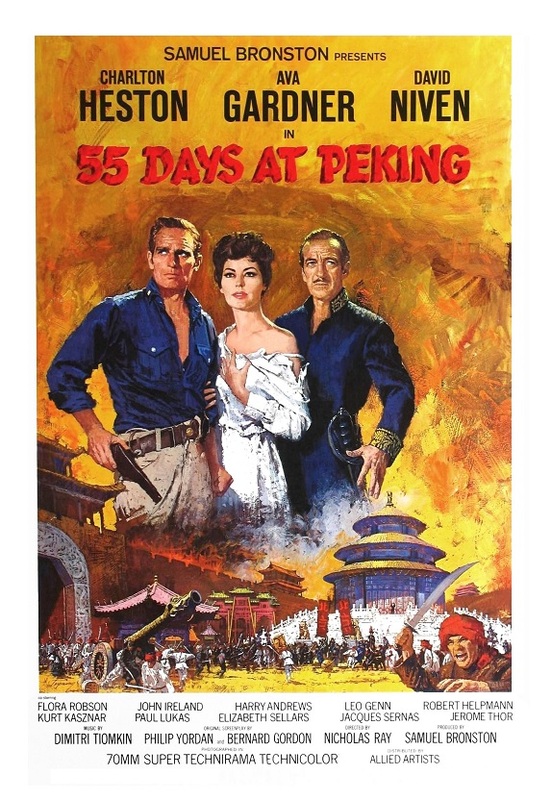 55 Days at Peking has too many unnecessary subplots. There is a tendency here to get lost in too many details, too many inconsequential characters. The film deals with events that changed the world forever so there was no need for multiple plot threads. At its best when focused on Charlton Heston (The Naked Jungle) and David Niven (Bedtime Story), who represent the U.S. military brass and the British diplomatic envoy respectively. I did find the politics of the movie provocative to say the least. 55 Days at Peking explores the relationship between Nationalism, xenophobia and racism. The film argues that China’s rejection of multiculturalism marked the beginning of the end of the Empire. That’s an interesting if controversial theory. I also found curious (and troublesome) the film’s (apparent) endorsement of colonialism. This attitude towards colonialism dates the movie badly. In any event, it is something that will make you think as you enjoy the spectacle grandiose. These are issues that are still debated today so the film is interesting to our modern eyes. Heston and Niven are in fine form here. Niven, in particular, gives a surprisingly strong performance. The two main Asian characters are played by Caucasians: Robson as Empress Dowager and Leo Genn (The Miniver Story) as Gen. Jung-Lu. The supporting cast also includes Harry Andrews (Alexander The Great) as Father de Bearn, John Ireland (The Incubus) as an American soldier, and Paul Lukas (Watch on the Rhine) as Dr. Steinfeldt. Director Ray has a small role as the U.S. Minister. I liked the film well enough to recommend it, but don’t expect a perfect production. Because the film covers the end of the Chinese Empire, 55 Days at Peking works as a pre-sequel to Bernardo Bertolucci’s The Last Emperor, which is about Emperor Puyi, the successor to Empress Cixi (here is an idea for an interesting if super-long double-feature). Color, 153 minutes, Not Rated. P.S. This is my contribution to The Ava Gardner Blogathon, hosted by Maddy Loves Her Classic Films. Not a bad film, but it just feels like it lacked that real spark to have made it into a great one. Ava’s character may not be all that necessary to the plot, but Ava certainly steals all the scenes she is in. Love her entrance to the dance. Thanks so much for joining. Merry Christmas to you. Yes, the film isn’t great-great but it does have its moments. And the cast is pretty good. Merry Christmas to you too! The cast is very good, down to the smallest roles. It’s a long, but entertaining movie. 1) Being a former U.S. Marine, you would think I would have made it a point to see this movie, especially since I mentioned it in my piece for this blog-a-thon. I hear you. I have similar approach when dealing with older films. I like to point out the dated aspects of a film, but these things rarely bother me. Context is everything. Really succinct and well crafted review. It’s a pity that so many films drop the ball when it comes to covering historical events. I’m glad Ava gives it all as usual. Agreed. Ava gave it all! Happy New Year! I watched this film many years ago, and I remember not being neither engaghed nor very impressed, but liking Ava’s character. Great review! Thanks for stopping by, and Happy New Year!!! I saw about 20 minutes in the middle of this film when it was on TCM one time. I had No Idea what was going on, so I gave up and forgot about it. I hope you’ll enjoy it! As I said, it’s a flawed but interesting movie.